Royal Princess became part of the Princess fleet today when Fincantieri delivered the 141,000-ton ship to Carnival Corp at the builder's Monfalcone yard. With Princess and Fincantieri executives and Italian government officials looking on, the handover was signified by the lowering of the Fincantieri and Italian flags from the ship’s mast, to be replaced by the flags of Princess and Bermuda. The brief video below shows the this morning's flag changing ceremony. Royal Princess will leave the yard on Friday for Southampton, where it will be named on June 13. Royal Caribbean Cruises Ltd ordered a third Quantum-class ship from Meyer Werft for their Royal Caribbean International brand. The 167,800-ton vessel is slated for delivery in mid-2016. Royal Caribbean said the pricing and terms are similar to those of the first two vessels of the series, Quantum of the Seas and Anthem of the Seas, which will be delivered in 2014 and 2015 respectively. No name has yet been chosen for the third, and finalization of the order is subject to financing conditions. The complete story appeared in the May 30, 2013, edition of Cruise News Daily. Royal Caribbean International said late this afternoon that repairs to Grandeur of the Seas will necessitate the cancellation of a total of six cruises. The line had previously canceled the May 31 sailing. In addition to that, they have now canceled the June 7, June 14, June 21, June 28 and July 5, 2013 sailings from Baltimore. Passengers on the June and July sailings will receive a full refund along with a future cruise credit of 25% of the fare they paid on the canceled cruise. The future cruise credit will be good on any Royal Caribbean cruise within a year. The complete story appeared in the May 29, 2013 edition of Cruise News Daily. A fire was reported aboard Royal Caribbean International's Grandeur of the Seas this morning (Monday, May 27, 2013) at 2:50am while the ship was en route to Coco Cay and 38 nautical miles from Freeport. The fire was reported in the aft mooring deck area of Deck 3 of the ship. The US Coast Guard was notified, and Carnival Sensation, which was in the area at the time, was standing by to assist should it have become necessary. Passengers were called to their muster stations while the ship's firefighters worked to extinguish the blaze. All 2,224 passengers and 796 crew members were accounted for. No major injuries were reported, however the ship's medical center reported treating four passengers, two after fainting, one for high blood pressure and one for a sprained ankle. Calling passengers to their muster stations is a precautionary measure that ensures passengers are in a safe area, and everyone can be accounted for. While it doesn't mean that the ship's command is necessarily anticipating evacuating the ship, it does have everyone in position and ready should it become necessary. The fire was extinguished at 4:58am, and once it was deemed safe, passengers were released from their muster stations. Most public areas and staterooms are accessible to passengers, however passengers are restricted from areas immediately adjacent to the fire scene at the aft of the ship. Grandeur of the Seas sailed to Freeport under its own power for further evaluation, arriving there at 10:15am. Royal Caribbean says the ship's critical system - power, propulsion and communications - all continued throughout the incident without interruption. Photos of the damage to the ship are below. Royal Caribbean dispatched a support team to Freeport to assist passengers with any special needs they have. Royal Caribbean International's president and CEO, Adam Goldstein, and other executives accompanied the team and met with passengers and crew. Most passengers chose to go ashore Monday afternoon, while some did staying aboard the ship. Passengers in staterooms affected by the fire are being accommodated in hotels in Freeport. Late this afternoon Royal Caribbean decided to cancel the balance of the current cruise and have the ship repaired at the Grand Bahama Shipyard at Freeport. Passengers are staying aboard Grandeur tonight (except for those in damaged staterooms who moved to hotels this afternoon), and everyone will be flown back to Baltimore on Tuesday. Passengers will be given a full refund of their cruise fare along with a future cruise credit in the amount of the cruise fare they paid for the May 24 cruise. It is good on any Royal Caribbean cruise within a year. This evening, Royal Caribbean announced they will also cancel Grandeur's next sailing, May 31. Passengers will receive a full refund of their cruise fare paid. If air fare was purchased from Royal Caribbean, they will also receive a full refund of that. If they purchased air fare independently, Royal Caribbean will pay the change fee for it. All passengers will also receive a future cruise credit in the amount of 50% of the fare they paid for the May 31 cruise. A special phone line has been established for family members of passengers on the May 24 cruise and for passengers booked on the May 31 cruise needing assistance. The number is 1-888-824-0012 in the US and +1-408-916-9000 internationally. Assessment of the repairs necessary will continue, and cancellation of additional sailings could come in the next few days. Grandeur of the Seas was on a seven-night cruise to the Bahamas that left Baltimore on May 24. The ship had called at Port Canaveral Sunday and was planning to call at Coco Cay today (Monday). This blog entry was updated throughout the day on May 27 as information was released. Further details appeared in the full Cruise News Daily article on May 28, 2013. 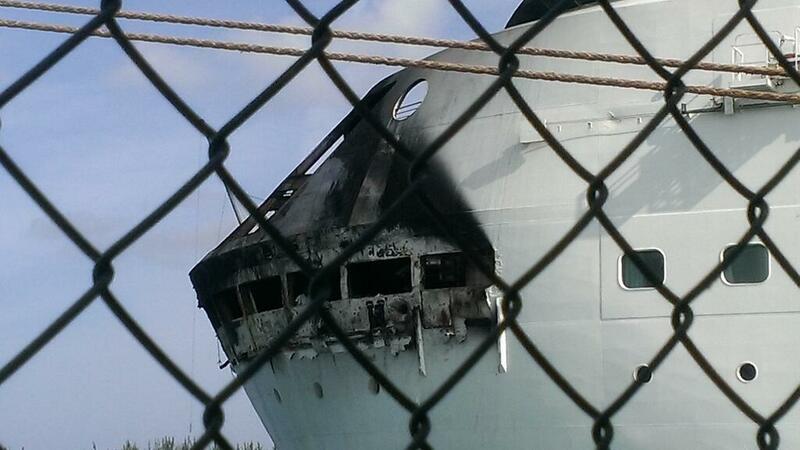 Grandeur of the Seas in Freeport on May 27 showing damage to the ship after a fire on the mooring deck. 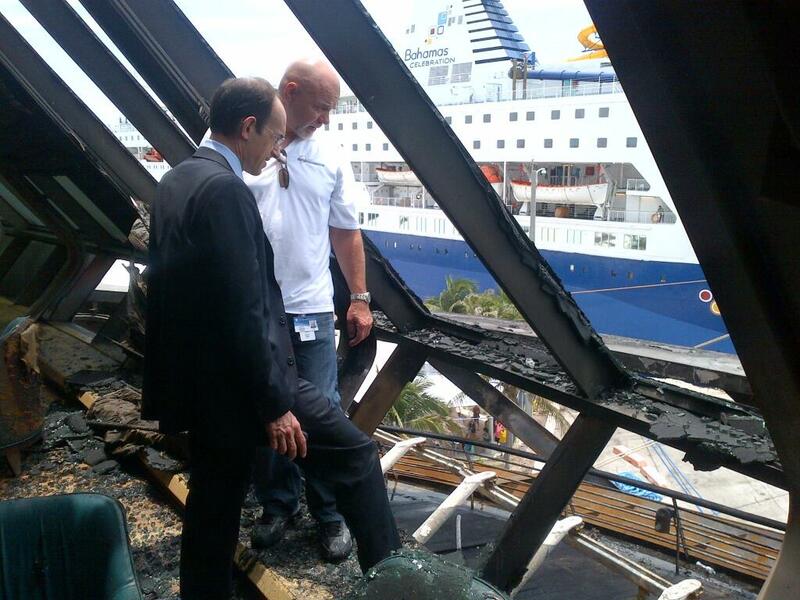 Adam Goldstein, pres & CEO, and Anders Aasen, AVP Technical Services inspect the damage on deck six. Most areas of the ship were unaffected. 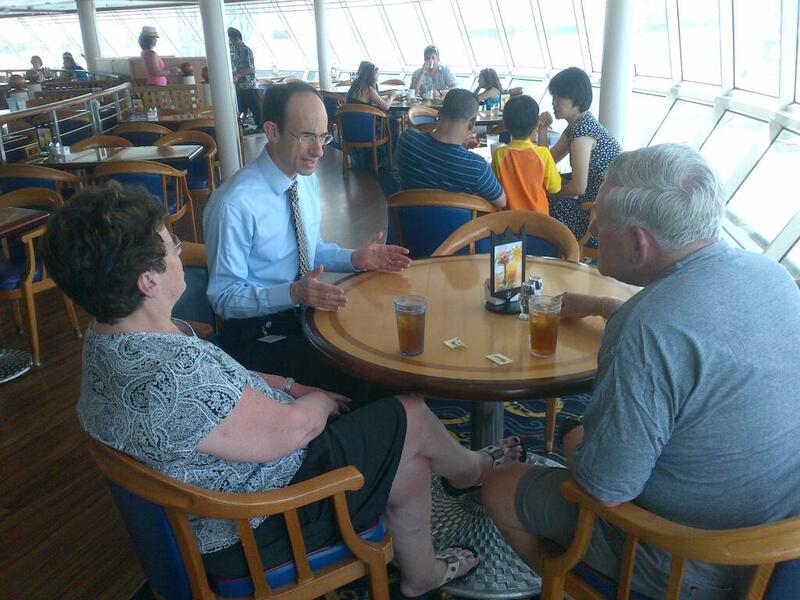 Here RCI president Adam Goldstein is shown talking with passengers in the Windjammer Cafe this noon.